Is your Kenmore refrigerator bottom-freezer model displaying an error code? 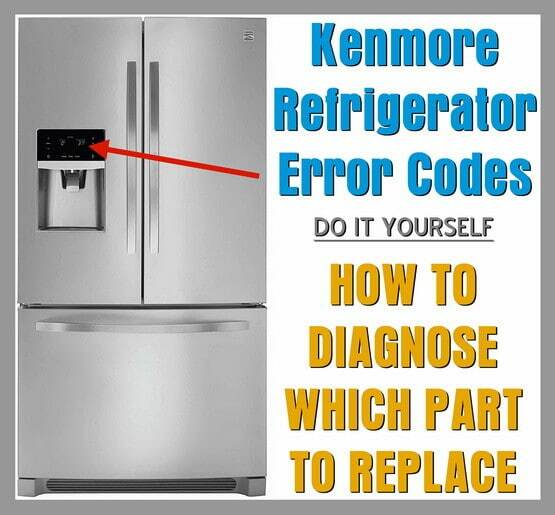 If your Kenmore refrigerator is showing a fault code, we can help. 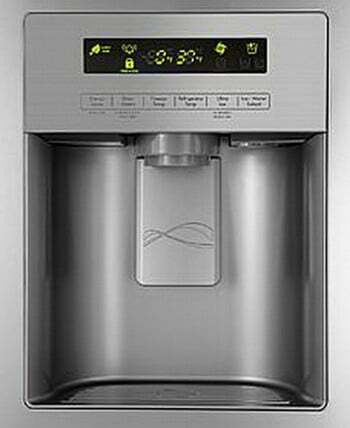 New style Kenmore Elite refrigerators have built in diagnostic systems. If your refrigerator finds, sees, or detects a fault or error in the system, it will show an error or fault code. The error code will display where the usual numbers are on the display screen. When an error code is displayed, your Kenmore refrigerator is telling you a specific fault. There are many different model numbers of Kenmore refrigerators (side-by-side, bottom-freezers, french doors) with digital displays so when you see an error code write down what is flashing or displaying. Don’t pull the power from the fridge if it shows an error code. If you pull the power plug it will erase the fault code. NOTE: Most of the error codes below are for Kenmore 795 models. The error codes below can help you to troubleshoot a fault with your Kenmore bottom-freezer refrigerator and fix it yourself. Parts Needed = The error code can be cleared by removing power from the refrigerator for 5 minutes, then plugging it back in. The code will be cleared, but can come back if the icing fan does not start to run. If the error continues to come back after the power has been reset. There may be ice formed around the fan housing preventing the fan from running. The fan cover can be removed. You can unplug the unit for 24 hours and leave the doors open. This will allow any ice build up to melt and return the unit to proper operation. 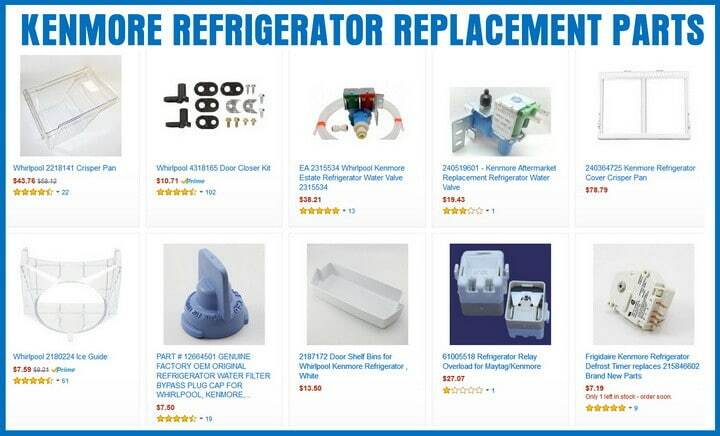 here are Kenmore Refrigerator Replacement Parts for less. Repair or Check = The pantry is the deli drawer. Short in sensor or wiring problem. Do you know of any other Kenmore refrigerator error codes we have not mentioned or are you having trouble with your Kenmore fridge? Please leave a question or comment below and we can assist. My Kenmore Elite Freezer Model No. 253.28712806 was beeping, showing an E5 error with a -23C reading. My husband doesn’t think the door ajar light was on, even though after opening the door and reshutting, the temperature went back to -17C. Everything seems to be ok now. However, manual indicates an E reading indicates service is necessary. Could you please tell me what an E5 reading means. The manual only gives information on E7 through E9. Thank you. Error code er rf on Kenmore elite. What does it mean? Kenmore ice maker light flashing and making clicking noise continously except when being used. I see all these codes that people are talking about. My Kenmore Elite Model 795.72373.310 quit cooling. I found the condenser coils very dirty and no ice on my evaporator coil. I have the thermostat set correctly, it is just not cooling and I get no error codes. I see the condenser fan running and pulling air through condenser coils and I cannot hear the compressor but it does vibrate slightly, giving me the feeling that it is on. I am wondering how to get into the diagnostic mode to have system give me some codes to give me an idea where problem is. Fridge is just over 4 years old, and doesn’t work, we have replaced 3 parts already that sears said were wrong and still not fixed, when you plug the fridge in the display blinks 0 on the freezer side and 37 on the fridge side and makes a beeping sound, lights won’t turn on when doors are open, no fans run. My Kenmore is showing a “5H” error code on the display. What does that mean? I have an error code L on my Kenmore refrigerator. We have a Kenmore Elite side-by-side refrigerator Model # 795.5107 795.5108 It is displaying Er dH What does this mean? I’m getting a code Er Co on my Kenmore Elite(795.77244600). The code chart indicates the problem is either the display board, control board or wiring harness. The fridge comes on normally for about 3 minutes. In that time I am able to see/use all buttons on the front display. I’m thinking these results would indicate the display board & harness are good leaving me thinking the control board needs to be replaced. Can anyone help verify my thoughts? I own a Kenmore Elite bottom freezer refrigerator model number 795.74013411 that’s less than three years old. I have again the error code er rf. It also happened last May! What a waste of food! Is this model a lemon? Last year they replaced the control board as well as something else. It starts by making a loud grinding noise almost like a distant lawn mower running. I have a Kenmore Elite bottom freezer 795.71033.010. I recently started getting the Er rF error code which may have something with the freezer evaporator fan. I would like to check and see if there is any frost buildup but I can’t find a way to access it. The back panel in their freezer compartment has no screws or obvious tabs to push in order to remove it. Can anyone help? The back panel merely pulls away, there are no screws. Remove the small panel for the thermostat on upper right corner. Get a small prybar and start at top left corner, as you pull you will notice the wires that connect the evaporator fans on the left upper corner and the wire for the thermostat on the upper right corner. Disconnect those before fully pulling the panel. what does sy ef indicate? I have a Kenmore Bottom Freezer # 795.7130, less than 3 years old. No error codes. I haven’t been in the house for a few months, but it is not cooling. No cold air in the refrigerator, some cool air in freezer, but water is not freezing. My Kenmore Elite Bottom Freezer Refrigerator Model 795.7209 is showing an error code of ErrF on the display panel. The fridge is not cooling but freezer is freezing. I am having the same error appear on my frig. What was the out come? Have constant error code of 88 88 but now showing 2222. My Kenmore elite grab N go refrigerator keeps getting a layer of ice under the pantry drawer with ice/frost build up at the back behind. What is the problem? Been happening almost since we purchased it in 2014. We take care of removing the build up only to have it return In a week or two. Possible defrost issue may be the problem. The layer of ice takes about a week to build up under the pantry drawer? Is there any water leaking down in that area by chance? Do you have the temp setting set to COLDEST? No apparent leak, but a lot of frost builds up. We do have it set at the coldest setting. I do have it set on the coldest. No obvious dripping inside, just tons of frost on the back inside above the pantry drawer and solid layer of ice under it. Keeps building up after being removed. My Kenmore Elite 795.74029.411 is showing an error code of Er rF. I unplugged and plugged back in, and the code does not reappear for a while (maybe 15 minutes). The Fridge was not cooling down before, or during, or after i rebooted the fridge. However the freezer was staying cold. There is a fan behind the air filter. I was able to flick it with a pencil and it turned freely. There was a build up of ice around the duct that feeds the meat tray. But that looks passive. I have emptied the fridge to defrost. I will retry in a a few hours. IF defrosting fails to fix, what do you suggest next? If after defrosting your Kenmore Elite Refrigerator, it still displays the Er rF error code, test the fan motor. This can be done at the control board or at the motor itself. I have the exact same problem with error code of Er rF on my Kenmore Elite 795.74029.411. Can you tell me what eventually fixed your issue MM? I have just unplugged it and will wait until it defrosts for several hours to see if it was just ice build up around the fan. Due to error code r dh, we ordered dispenser control board part EBR 78988402 for Kenmore Elite bottom freezer refrigerator Model 795.74023.410. Now we need instructions how to replace the old board with the new one. Wait 30 minutes in case board is holding any power. Unscrew panel where board is located, screws should be located at back of dispenser housing. Pull the wire harnesses off the old board one at a time and connect to new board. Check connections to be sure they are secure. Put dispenser display back on and reassemble. Here is a replace fridge dispenser board tutorial to assist you. Linda did that solve your problem??? My 8 month old refrigerator is showing r dH also is why I am inquiring. What does the DF error code mean on a 31 cubic foot Kenmore elite refrigerator? Are you sure the error code is DF and not DS, DH, or GF? The DF error code for Kenmore is not in the database for Kenmore error codes. I have a 3 year old Kenmore Elite French door refrigerator, part 975720-53110. It has had problems since 12/29/2015. Initial problem was no ice, then freezer slowly failed, followed by fridge compartment. Sears Repair has been over a number of times, has replaced freezer evaporator, condenser, the step valve, compressor, the freezer grill assembly (this was a service recall), and most recently the defrost assembly. Of course this has occurred over a painful series of appointments. The most recent service, replacing the defrost assembly (ok, this is a wiring harness with two thermocouples) just happened, and was ordered by a technician who spent time on the phone with his tech support and checking voltages on the circuit board. I was puzzled about this decision because at this point the fridge gives the dreaded ER FF on the front…so why replace the defrost assembly? Technician wasn’t interested in explaining anything to me. As predicted, replacing that part hasn’t changed anything. Current status is same as when the last diagnostic happened: Fridge is good, runs about 35-38 F. Freezer hangs around 20F (it eventually makes ice but that’s all it’s good for). The air blowing into the ice maker is around 10F. I’ve unplugged and replugged it in. Do I call Sears again, and push them to replace the circuit board? Is this something I can get local help with? Are there any other reasons for the ER FF? Kenmore error code Er FF indicates a problem with the evaporator fan motor but it can also be with the main control board. When the power cord is disconnected for 30 seconds and then reconnected, it resets the board. Sometimes this procedure corrects the problem and sometimes it does, for only a short period of time. Usually in this case, the main board will need to be replaced. The error code er rf indicates a problem with the freezer evaporator fan. You will need an ohm/volt meter for this. If the fan motor is testing okay, then the problem is most likely in the control board. Kenmore side by side bottom freezer error code ER FF. Please help! Kenmore refrigerator error code ER FF (er ff) means a problem with the evaporator fan motor. This can also be an issue with the main control board. Disconnect power for 30 seconds and then reconnect, it may reset the board. Usually the main board will need to be replaced but check the fan first. Determine if the fan is running. If the fan is not running then replace the fan. If the fan motor is running then the main board will need to be replaced. The main board is located behind the unit. Got the Er rf error code. Opened inside lower back freezer panel, Unplugged 2 fans (1 fan to the ice maker, 1 blow air inside the freezer) and the freezer sensor. If I plugged in the 2 fans back and left the freezer sensor unplugged, both fans worked then the Er rs (freezer sensor appeared after 3-4 hours? If I plugged in the 2 fans and the freezer senor, the whole refrig seemed to stop reset, then only the fan blow air to the ice maker worked. The fan that blows air inside the freezer did not work and the code Er rf reappear in few hours. So the issue is not the fans. Don’t know if it is the freezer sensor or the board? Sounds as if the Main PCB board is malfunctioning. From what you have described, this is most likely the issue. What is the model number of your Kenmore Elite refrigerator? I have a Kenmore Elite Refrigerator 795.72092.310 was giving an ER rF code. A Sears technician said we needed a new control board, so we replaced it and we’re still getting that code. Kenmore Elite Refrigerator ER rF code means issue with fan in the fridge. Pull the rear venting off inside the unit (after removing almost all of the shelving). See if you find any ice on top of the coil or the bottom of the fan shroud. The ice in the fan shroud (if present) may stop the fan from running and this is the cause of the error. Clear the ice out and reassemble everything. If fan is bad or faulty, replace the fan. You can buy a fan for around 20 dollars online. I am getting code: R dH. How do I find and check the fuse? I have Kenmore model #795.7757360 and I get error er 1f and I checked the icing fan and there is no ice on or around it. I did notice that the fan does not stay on if is continually turning on and off for different intervals. There is no set pattern or time that it is on for or off but it is fairly consistent on and off. Should this fan be on and off like this or should it be a constant on? If it should be constant on then what controls it or will replacing the fan take care of the issue? It should only be on intermittently. The Kenmore refrigerator error code er if means that the main control board lost a feedback signal from the icing fan motor for over 2 minutes. -This fan is located in the rear of the freezer section, on the left side of the fan cover. -The fan supplies cold air for the compartment where the ice maker is located. -The error code may be cleared by disconnecting power to the refrigerator for about 3 minutes, then plugging the unit back in. -The code will be cleared, but may come back if the icing fan does not start running. -If the error continues to come back after the power has been reset. -There may be ice formed around the fan housing preventing the fan from running. -The fan cover can be removed, but is time consuming and difficult. -You can unplug the unit for 24 hours and leave the doors open. -This will allow any ice build-up to melt and return the unit to proper operation. Sears guy said that the motherboard was not a major component part and NOT covered. His illustration was that the motherboard was the brain and the condenser was the heart, therefore the motherboard isn’t covered. I told him bad example since I don’t know too many people that can operate without a brain (even though it seems like many people do these days!). At the end of the story…they didn’t cover it. I even went to the local store where I purchased it and they said the District Manager would give me a call to discuss. That was three weeks ago. I called again yesterday and they said I would have a call by the end of the day (that came and went) from the District Manager. I intentionally went to Sears when we purchased this refrigerator (along with dishwasher, microwave and oven at the same time). Let’s just say that my experience with Sears has been the exact opposite of what I thought I was going to get. Needless to say, I am FOREVER done buying anything from Sears and I will tell anyone that will listen about my experience. Fridge and freezer both went out simultaneously. Called Sears and had service person come out and diagnose that it was the mother board based on the green light (that is part of the motherboard) blinking 7 times (he showed my in his manual that it was an indicator the motherboard went out). Motherboard was replaced and it started working for about two weeks and has completely gone out again. This time the green light is blinking 6 times. Sears is coming back out in 6 days to “re diagnose” the fridge. This fridge is only two years old and Sears is saying that it is not covered under warranty but in the owners manual, there is 5 year coverage for major component parts. Just trying to find out if this is a lemon or just a piece of junk and stop wasting time, food and money on a bad piece of equipment. What is the model number of your Kenmore Elite refrigerator? We can research this further with the exact model number… Anyway, did the tech replace the motherboard under warranty? Whatever the situation, if the manual says 5 years, you SHOULD be covered. Tell them they sold you a BIG LEMON and you want it fixed under warranty. Call the BBB if they do not comply. First, you must read the fine print to be sure that electronics are covered in the 5 yr warranty. If you give us the model number, we will research further. The computer in the back of my Kenmore Elite is blinking a green light 6 times. Any ideas of what this means? I used to blink 7 times which said that the computer board was bad. Replaced it, not it is blinking 6 times. Are you having issues with a dishwasher or a refrigerator? The blinking lights are mostly used on Kenmore dishwashers. This is on the refrigerator, in the back after I remove the panel for the motherboard. Is the control panel locked up? Everything working besides the lights flashing on the rear main control board? It is flashing 4 or 5 times? What color is the light? You are talking about the MAIN MOTHERBOARD on the very back of the fridge, correct? I am getting an error code “Er dH” on my Kenmore Elite Refrigerator 795-71323. What does this indicate? Error code “Er dH” for a Kenmore Elite Refrigerator 795-71323 means a bad defrost heater. Check the board before ordering a heater as any part that needs to be replaced should be confirmed. To get to the defrost heater first unplug the refrigerator, remove all the baskets and the bin, open the drawer all the way and use a small flat head screwdriver and slide between the left gear and the rail to unclip it. Remove the front freezer panel and pull the panel off. You will see the evaporator coils and underneath the coils is the location of the defrost heater. Pull the defrost heater off the coils without damaging anything. Remove and replace. I have error code S5 showing on my new Kenwood fridge freezer what does this mean? This is the first time it has been switched on. Do you mean Kenmore refrigerator? Can you give us the model number of your fridge? Are you sure the error code is S5? I have a Elite Kenmore Refrigerator Model 795.72183.211 I’ve replaced the filter and the fan motor evaporator still getting error code Er rF on the display also replaced the control board still getting error code every 3 hrs. Need help correcting the problem. If you have replaced the fan and control board, the next part that could cause this error code Er rF could be a bad wire harness or connection. Have you gone through and traced all wiring? Check for anything loose or damaged. If all wiring is in good condition and connected securely, you may have a faulty control board. Even though it is new it may have an issue. Check wiring and then if you have exhausted all troubleshooting, see if you can get a new replacement board. I am getting an error code Er rF on my Kenmore Refrigerator. What do these error codes indicate? Kenmore refrigerator error codes Er rF indicates a problem with the freezer evaporator fan. You will need an ohm/volt meter to test it. If the fan motor is testing good, then the problem is most likely in the control board. I have already replaced the mother board. Neither the fridge nor freezer are cooling. Green light on mother board blinks 6 times. So, the motherboard that you just replaced is blinking? Why did you replace it in the first place??? No cooling in the fridge? Was the earlier problem the same as the one you are experiencing now? Meaning the board may not have been the issue in the first place? What was the old motherboard doing? Was it also blinking? We are asking so we can find the root cause… Please give detailed description.